The Framingham Heart Study in Massachusetts, USA, has been running continuously since 1948. 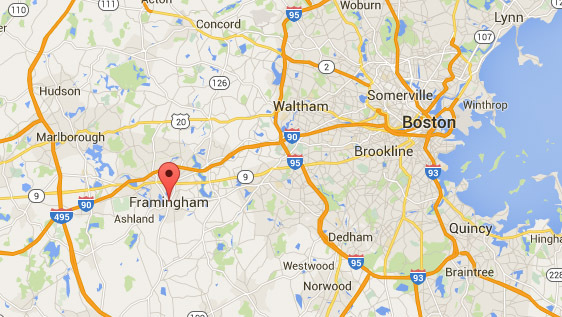 The study began with 5,209 inhabitants in Framingham aged between 30 and 62. The study is now on its third generation of participants. The objective of the Framingham Heart Study was to identify the common factors or characteristics that contribute to cardiovascular disease (CVD) by following its development over a long period of time in a large group of participants who had not yet developed overt symptoms of CVD or suffered a heart attack or stroke. ​1960: Cigarette smoking found to increase the risk of heart disease. 1961: Cholesterol level, blood pressure, and electrocardiogram abnormalities found to increase the risk of heart disease. 1967: Physical activity found to reduce the risk of heart disease and obesity to increase the risk of heart disease. 1970: High blood pressure found to increase the risk of stroke. Average cholesterol levels was 220 mg/dl. Half of the group that did not develop CHD had higher cholesterol levels. 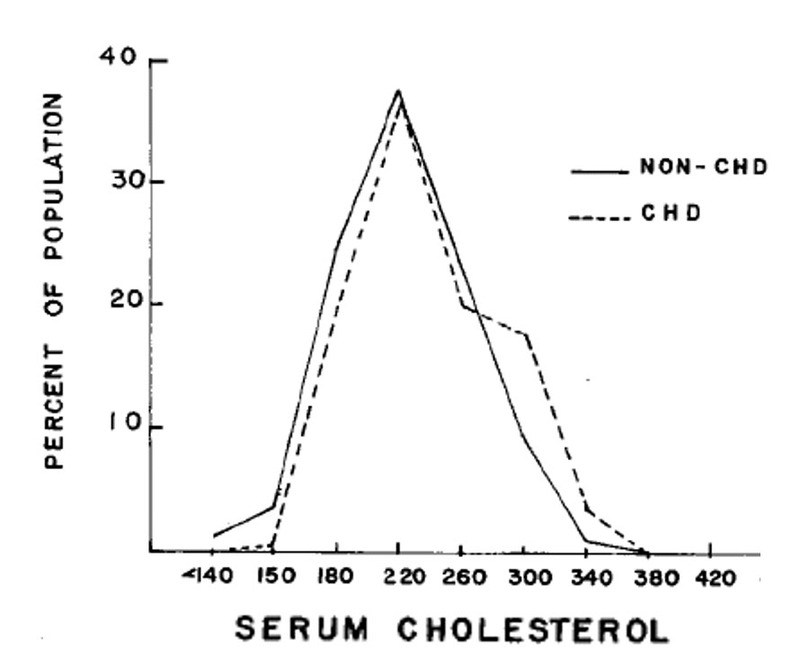 Half of the group that developed CHD had lower cholesterol levels, albeit there is a slight increase around 300 mg/dl. However, this was not enough to conclude that high cholesterol levels corresponds with CHD. ​Now, LDL particles (LDL-P) appear in different sizes. Large LDL particles are called "Pattern A". They are fluffy in substance and can carry large amounts of cholesterol. Therefore is the number of LDL particles low. Small LDL particles are called "Pattern B". They are dense and can only carry small amounts of cholesterol. Therefore is the number of LDL particles high. In 2007 was it published a study in NCBI named "LDL Particle Number and Risk of Future Cardiovascular Disease in the Framingham Offspring Study – Implications for LDL Management". This study ran for nearly 16 years, and the participants were divided into four groups with high and low LDL-C and high and low LDL-P respectively. ​The study shows that those with high LDL-P have higher risk for cardiovascular disease than those with low LDL-P, regardless of their LDL-C.
High blood pressure is a risk factor for cardiovascular disease. Obesity represents a significant risk of cardiovascular disease independent of age, cholesterol, systolic blood pressure, cigarettes, left ventricular hypertrophy and glucose intolerance. It is not possible to select a total cholesterol or LDL cholesterol value that separates those who are at risk for cardiovascular disease. Factors other than total cholesterol or LDL cholesterol must be considered when evaluating the risk for cardiovascular disease. 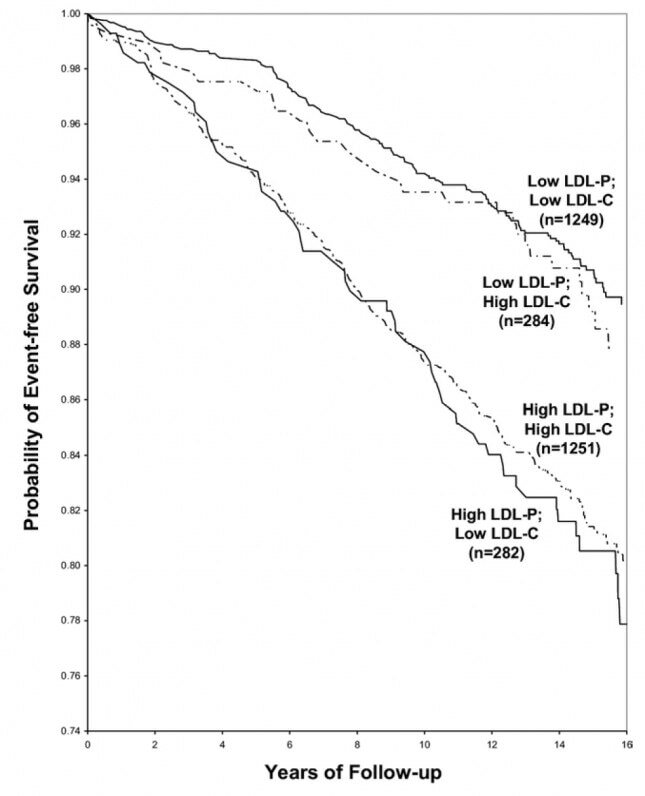 Low levels of HDL cholesterol are associated with increased mortality. "If your cholesterol is below 300, there is no significant association between your cholesterol and heart disease." - Dr. David Diamond about the Framingham Heart Study. - Framingham Heart Study: Official site. ​ - NCBI 2007: "LDL Particle Number and Risk of Future Cardiovascular Disease in the Framingham Offspring Study – Implications for LDL Management"
- "Obesity as an independent risk factor for cardiovascular disease". ​ - "The Framingham Heart Study and the Epidemiology of Cardiovascular Diseases: A Historical Perspective". ​ - "Cardiovascular Risk Factors". ​ - "Cholesterol and lipids in the risk of coronary artery disease". - "High density lipoprotein cholesterol and mortality". - Ron Schmid: "Cholesterol, Animal Fats and Heart Disease: A Modern Myth? Framingham and Ancel Keys." ​ - Dr. Michael R. Eades: "Framingham flip flop."